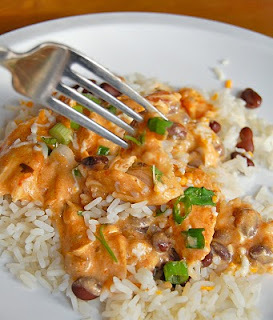 Click to pin salsa chicken! I made this salsa chicken recipe on a night when we planned to have company, but bad weather caused a change of plans. Just as well, since it was so tasty, Peanut and I might have decided not to share it! This is a crockpot meal, which is awesome because it's one pot, no fuss, hardly any mess. It was super simple to throw together, and we all loved it, including Baby M. I served it with black beans and rice, and we all had seconds. This is going into regular rotation!